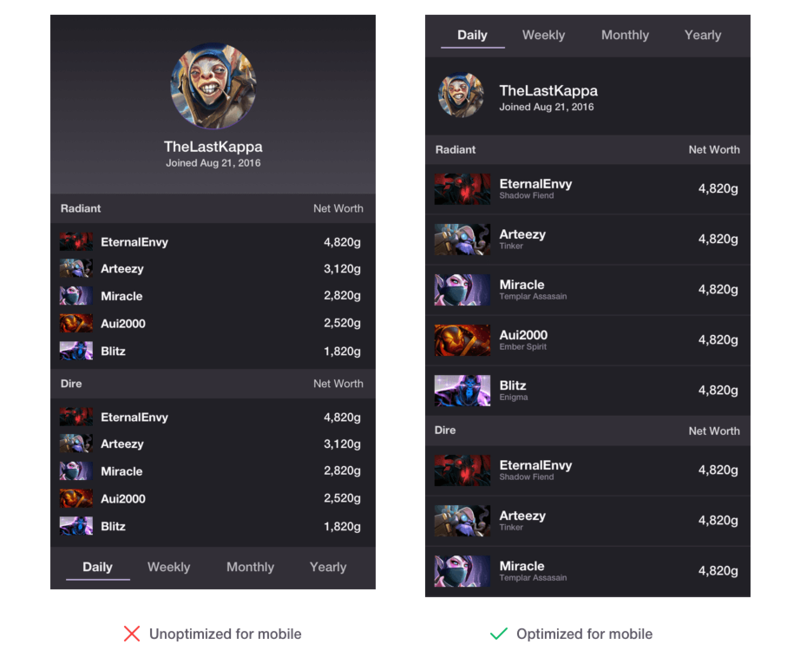 If you are just getting started with Extensions, use the recommendations in this guide to put your best foot forward for streamers. If you already shipped an extension, use this guide to take your extension to the next level; e.g., with other extension types, such as panel or video overlay. 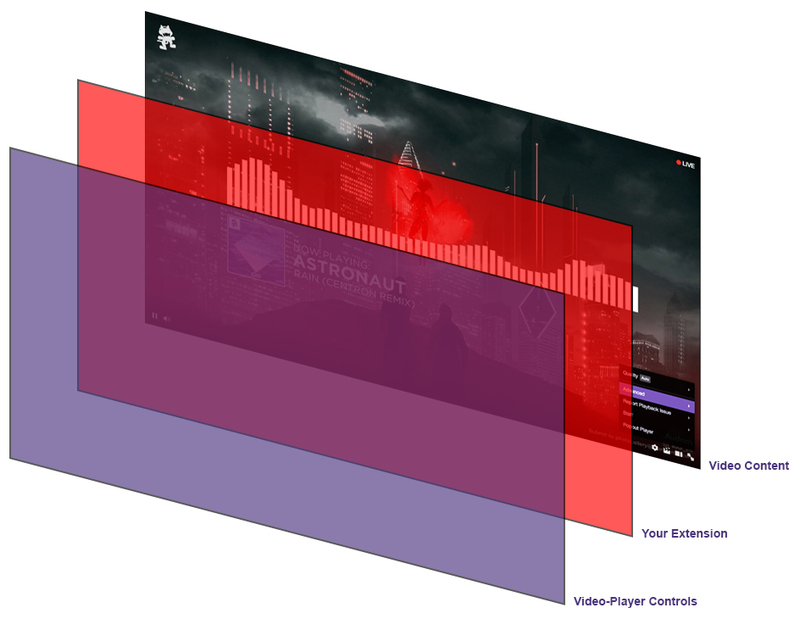 Extensions provide new ways to interact on Twitch, so we provide guidelines to help ensure your experiences are harmonious with the overall Twitch experience. The guidelines in this section apply to all extension types. Guidelines for specific extension types follow this section. The Twitch Extensions directory showcases all Extensions available to broadcasters, letting them see examples of each extension as it would appear on their channels as a panel, video overlay, or video component. Follow these guidelines. All fields are specified in the Extensions manager. The extension’s Name is how you define what streamers know it as. The name can show up in many places, such as the Extensions manager and the details page. Use a descriptive name that allows streamers to understand what your extension does at a glance. Don’t change the name, unless the nature of the extension has changed significantly. Don’t use words unrelated to your extension, just to boost your extension in search results. The Summary is a short description of your extension that streamers see when hovering over the discovery splash screen in the Extensions manager. The right summary helps them decide to install the extension. Use as a selling point the most important benefit to a streamer using your extension. Be concise. Don’t try to explain everything your extension does in the summary. The Description is a longer explanation of your extension. It appears on the details page. Write the description from your streamer’s viewpoint. Let streamers know how your extension will improve and enhance their channels. Consider writing in the second person (using you/your), to more closely associate with streamers. The Discovery Image is the first thing streamers see of your extension. The Extensions manager shows this splash screen in the Discovery tab on a broadcaster’s dashboard. Don’t use a lot of text; that overwhelms the image. Avoid having too much detail in the image, to maximize visibility. Avoid transparency in your PNG. Screenshot Images are your best tool to help streamers understand how your extension works, if they haven’t seen it on someone’s channel. Provide clear images that display how your extension works. You are required to choose a General Category for your extension. If your extension fits in more than one category, chose the most appropriate one. Don’t choose a category that your extension clearly does not fit into. Example: Specifying the “Schedule and Countdowns” category for a Destiny 2 gear extension. If your extension supports specific games, you can indicate which ones under Game Category. List only those games your extension supports. Once the extension is configured and installed, make onboarding for viewers seamless, to increase engagement. For video-based Extensions, a subtle animation can be used to draw the user’s eye to engage with your experience. For panel Extensions, consider a splash screen explaining the extension’s capability (unless it is an informational extension, such as dynamically displaying the top cheerers on a stream). Extensions should not be distracting (remember the <blink> tag? ), but it is fair game to provide small clues; e.g., subtle bounces to indicate interactivity and brief flashes to indicate state changes. A distracting extension forces the viewer’s attention on your extension, away from the broadcast. The paradigm is still new and might require a little training of Twitch viewers. If your extension requires some setup by viewers, consider disclosing those steps progressively throughout the experience: ask for only the information you need to get to the next step, rather than all the information up front. This includes asking for authorization from a viewer to share the viewer’s user name with the extension. Ask the viewer to authorize only when the extension requires the user name to continue. Also, it helps to explain to the user the value of the extension and why the extension requires user names, before asking for authorization. First and foremost, fans come to Twitch to engage with broadcasters. If broadcasters find that an extension will help grow their channels, they are more likely to install it. Some Extensions may provide utilities that are widely applicable to many broadcasters; e.g. leaderboards and top viewers. Other Extensions, like those made for a specific game, will have smaller audiences; that’s okay! Regardless, serving broadcasters first increases the likelihood of your extension being a part of their channel’s experience. The channel stream real estate may limit how your extension appears or is placed on the video. 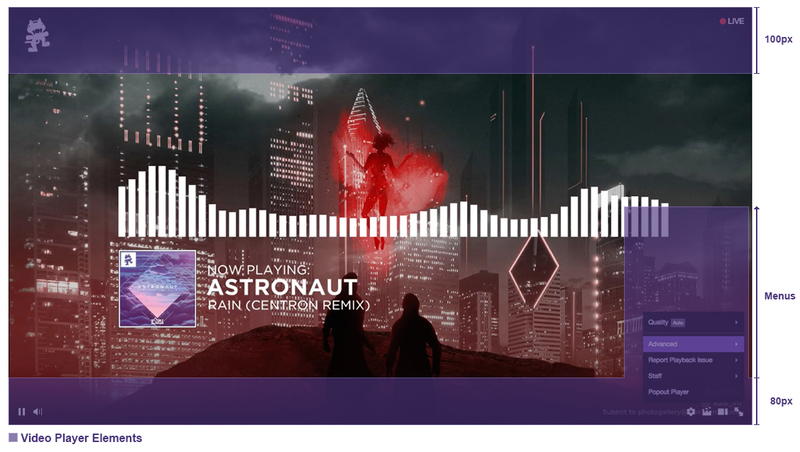 Top streamers often leverage broadcasting studio apps (like OBS) to create brand elements, animations, and live content to augment the broadcast. Given the shared space that Extensions occupy, assume that a streamer is leveraging tools like OBS to create a canvas that may interfere with the area where your extension UI will appear. Following this assumption, Extensions should include configuration options for broadcasters to align the experience with their channel’s branding. Consider allowing color, font and other UI customizations, to ensure your extension blends in with the overall experience. Consider including extension capabilities that can be minimized or hidden by users, and only take up areas of the real estate that make sense given the content a streamer broadcasts. For example, a Hearthstone stream has most of its action in the middle of the board, so occupying the top right of the video will ensure your extension does not interfere with the game’s content. However, if your extension augments the information about the game and may require placement closer to the content on video, make sure it can be collapsed, to ensure you limit its interference with the content/game. With potentially hundreds of thousands of users interacting with your extension every day, there is a chance your extension will have issues. Even relatively simple Extensions (like those that display the gear a streamer uses to create a broadcast) can have hundreds of failure points. Just like any app, anticipating general failures goes a long way to build user trust. Apps should handle 404 or 500 errors by providing ways for viewers to provide feedback and leverage some other part of your extension. Apps that fail to retrieve data also should allow users to provide feedback. Streamers control the placement and use of Extensions, so your extension should be prepared to accept feedback directly. If there is no option for support, that could lead to a bad experience for Twitch and risk your extension being pulled from our directory. Content — What does your extension do to expand specific stream content? Does your content relate to a game or does it provide an integration to other apps (like those that play music)? Extension content helps determine whether the information needs to be situated next to the action: content that pertains to your channel is well suited as a panel, whereas content for a specific game may make sense as a video overlay. Context — Does your extension depend on real-time interaction? Do you need the streamer’s help to direct attention to your extension? Extension context helps determine whether your extension needs to be adjacent to the stream content or is better suited as a panel. Branding — Your extension’s branding should be clean, recognizable, and unique. In general, use your logo sparingly and use brand color to enhance your brand on Twitch. Your extension cannot include Twitch-branded elements, including the Twitch or Glitch logos. The extension includes buttons that invoke Twitch specific actions such as following a streamer or taking a clip. You are supporting light vs. dark mode for panel Extensions. Contrast and accessibility — Always provide enough contrast between colors, to ensure your designs are as accessible as possible. Avoid links on backgrounds that are of similar contrast. Consider your color-blind audience. We recommend you use this contrast checker tool. Layout — Use alignment and hierarchy for ease of visual scanning. Optimal layout depends on the type(s) of Extensions you make available for broadcasters; see sections below. Stateful feedback — Preload wherever possible, especially on overlay Extensions. Overlay Extensions should avoid the use of “loading” indicators, which can interfere with the viewing experience. If a panel extension needs to display a loading state, design your loading state to be as clear and concise as possible. Consider adding a loading indicator. Use status indicators to communicate updates, errors, and other statuses that your extension may require; your audience should not have to guess what is happening during a call to action. 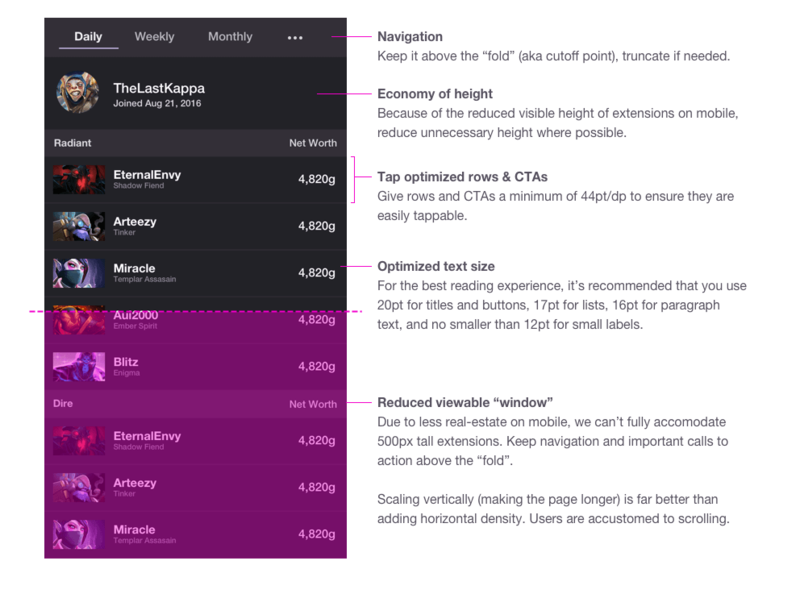 Navigation — In general, avoid multi-layered navigation in Extensions. If you must have hierarchical navigation, always provide a clear path, to let users know where they are. Ask yourself if each navigation element is necessary. A panel extension appears in the panel area below the video player. Panel Extensions remain active even when the channel is not live. Online/offline — Consider how panels work offline, as well as online. Panels can provide a continued reason for viewers to stay on a stream, even if the streamer is offline. 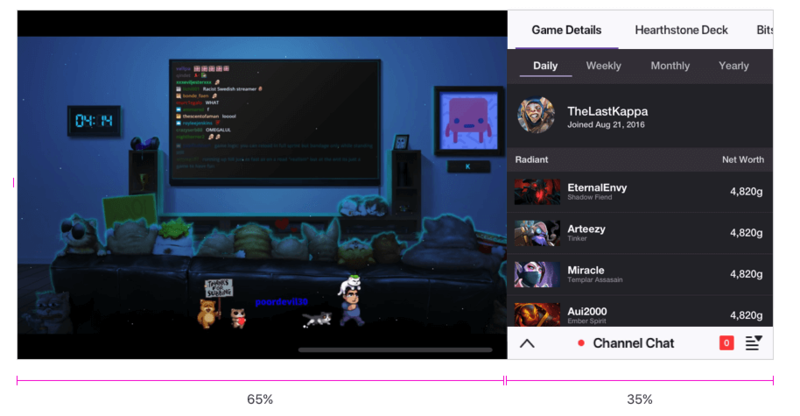 Uses beyond game content — Since panels do not reside on video content, they experiences do not have to be as tightly coupled to the streamer’s content as other types of Extensions. Panels are great for displaying high-level stats about the stream, gear a streamer uses, or other fun content that has no relationship to the content they choose to stream. Panels also can be treated like a mobile web app, housing a game or productivity app within them. Layout — Panel Extensions are limited to 318px wide x 496px high, to avoid iframe scrolling. Within this box, try to allow 10px of inner padding for any text within your extension, for maximum readability. Video-overlay Extensions are meant to enhance the viewer’s experience, so be aware that each extension element covers valuable real estate. Sizing — When designing your extension UI, take into consideration that it needs to scale and adapt when the browser and video player resize. By default, a video-overlay extension functions at all sizes while the broadcaster is live. Consider hiding your extension when the size is reduced to a point that the extension becomes non-functional. iFrame boundaries — For drag-and-drop elements, consider how your video-overlay extension will respond when a user tries to move an element outside the video player’s viewing area. Design your extension to block elements from being relocated to outside the viewing area and/or force them to “spring” back into the viewing area. Disabling — A video-overlay extension disables itself when the broadcaster goes offline or hosts another channel. When a viewer pauses the video, the extension iframe is hidden until the viewer unpauses the video. Player control layers — Keep in mind that your video-overlay extension will be rendered below all our video-player controls, such as pop-up menus, mouseovers, LIVE indicator, and channel information in the top left of popout/ember versions of the video player. Remember that theater mode, full screen, and embed have different UI layouts than the “normal” Twitch player. Your layout should be fluid — Your extension’s layout should gracefully adapt to the available space. Do not assume any specific aspect ratio or dimension. Design for touch — Make sure interface elements that are actionable can be comfortably reached. Evaluate the tap target sizes and their relation to neighboring actionable elements. Consider a target size of no less than 44 pt/dp. Reduce noise — Trying to pack all your Extensions’ capabilities in the limited real estate will overload users with too much information. Bring in only the essential components of the experience. Limit buttons, images, and text that will be in view. Disclose actions progressively and contextually. Navigation should be obvious — If you are incorporating sub-navigation in your Extensions, make it obvious, with common mobile navigation patterns and affordances. If you do implement a navigation, indicate to users where they are within the extension, to keep them grounded. Interface elements should be clear and visible — Color and contrast are important in helping users understand the different elements of your extension. Take into account the visual hierarchy and proper spacing and text size for legibility. For guidance, some examples are given below. Your layout should be fluid — As with mobile design, your pop-out extension’s layout should gracefully adapt to the available space. Do not assume any specific aspect ratio or dimension. Consider opportunities to take advantage of additional real estate — When popped out, an extension initially is displayed in the native size shown on the original page. Since viewers can resize the new window as desired, extension developers with pop-out support may control more screen real estate than the original extension size.